Last week, I spent three days crisscrossing Louisiana on a .NET User Group Road Trip. I made stops in New Orleans, Baton Rouge, and Lafayette, and I had a great time interacting with the LA .NET community (that’s LA as in the state, not the city). We packed the house and talked about what’s new in Silverlight 4 and ASP.NET 4. It was a lot of information to cover, but we managed to get through it all, and hopefully there are 100+ developers in Louisiana more ready for .NET 4 this week than there were last week. Thanks to everyone that came out for the events! This past Friday, Telerik hosted a new “Ask the Experts” webinar where a panel of Telerik experts, including Evangelists, Developer Support Specialists, and Telerik MVPs, answered your questions about the Q1 2010 release. It was a successful experiment, and many questions and answers were exchanged. A huge thanks to those of you that attended and brought questions, and of course, join me in thanking our Telerik MVP experts for their time. The video recording of this event will be posted to Telerik TV soon, but in the mean time we are providing a complete recap of the major questions with their answers! We hope you enjoy this resource and join us for more “Ask the Experts” events in the future. Are there any limitations or issues in using any of the new Q1 2010 products in VS 2005 such as ASP.NET AJAX, Open Access or Telerik Reporting? OpenAccess ORM, Telerik Reporting, and the RadControls for ASP.NET AJAX all work in VS 2005, VS 2008, and VS 2010. Obviously, some features that are specific to new versions of the framework, such as LINQ, will not be available in 2.0 projects, but otherwise, these are supported IDEs. More information can be found on the “System Requirements” page for each product. You said Telerik Q1 2010 supports the .NET 4.0 framework. Our project is still on 3.5 and we don’t plan to upgrade to 4.0 anytime soon. Can we still upgrade to Q1 2010? The Q1 2010 release did indeed add support for the .NET 4.0 framework but that does not mean that it exclusively targets 4.0. As with our previous releases we still provide support for the .NET 2.0 and .NET 3.5 frameworks. These are offered via different assemblies, which are located in your local installation folder (usually C:\Program Files\Telerik\RadControls for ASP.NET AJAX Q1 2010) under Bin (2.0) and Bin35 (3.5). If you are currently using .NET 3.5 and are looking to upgrade you will have no issues with installing and using the Q1 2010 release. Can you share the future direction of your UI controls, particularly the AJAX and Silverlight controls. Any certain things you will focus on or add? Thanks. The future of our UI controls for both Silverlight is actually heavily influenced by you, our developer community. With the launch of PITS, we have provided a nice and easy way for users to submit requests for our controls and vote upon them. If you see a particular feature that you would like to be included either in an existing control or perhaps a brand new one, vote on it! Through these submissions you can directly influence the evolution of our RadControls and our other products. Any chance of seeing the Outlook Bar from Silverlight in the ASP.NET suite? As always, Telerik’s bases it plans on feedback from customers. If you’d like to see this tool in a future release, be sure to submit a Feature Request in the Telerik Public Issue Tracking System (and vote on other existing requests you want to see). Is there any plan to add more validation controls for ASP.NET? Looking at our release history you can see that we always try to add validation to our controls. If you have not tried the RadInputManager, you will discover that it is a very powerful control that makes it easy to apply basic validation to many textboxes on a page. We are also researching the option to add direct support for Data Annotations to the RadControls to make validation configuration easier. Don’t forget to log your request in PITS so that your votes for new validation controls can be heard! There are also other formats which you can export to (see the Overview article) and each one has a specific documentation article discussing what you can do in order to achieve the style you are looking for. As seen in the above article there is a lot of manipulation that can be done via this approach. If you are looking to do something outside of just a Count Aggregate the later approach is the recommended implementation. How about some more MVC webinars and examples? We will continue to expand our MVC resources in 2010. Make sure you don’t miss the recently posted videos to Telerik TV showing you how to work with the Telerik MVC Grid. You will learn how to setup an MVC project with the Telerik Extensions, how to configure data binding, and how to setup inline data editing. Can we use the Telerik themes as a basis for new themes in the new Visual Style Builder for WinForms? The Telerik themes have not yet been converted to the new theme repository format. We plan on updating them all for the Q2 release. You will then be able to use them as the basis for new themes. How similar can the SL GridView control behave like Excel? You can make the GridView perform similar to Excel, but keep in mind that a GridView is not designed to be a complete Spreadsheet replacement. There is a CurrentCellChanged event, in which you set e.NewCell.BeginEdit(). With this set, every time the cell changes, it instantly enters edit mode. If you subscribe to RowEditEnded, you either save changes or add new records based on EditOperationType. The end result is that every change you make to a row triggers a save in the database. That said, this is still not spreadsheet and you can’t do things like cell referencing, multi-cell selection (coming Q1 SP1), or formulas in the cells from the client-side. Can you post the source for that MVVM sample? The source for the MVVM demo will be made available on Ross Wozniak’s blog. You can subscribe to his blog and catch the update by visiting the Telerik.com Blogs. 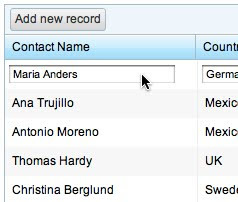 Silverlight Question: Where can I find the template/code for textbox with search/magnifier icon shown on the Telerik Silverlight demo apps? Thanks. In this specific case, the code is part of the Telerik QSF, and only available as source if you have a subscription license. An easier solution is to use a tool like Silverlight Spy, which lets you dive into styles and XAML by “picking” elements on the screen. With this tool, you can quickly examine the Telerik QSF and see the template being applied to the TextBox. What is the best way to debug performance issues in Silverlight? I’m having a problem where my RadComboBoxes are taking a long time to expand (up to 5 seconds with only 48 items). I am not able to recreate the problem in a basic demo application. Starting with Silverlight 4, you can now use the Visual Studio 2010 profilers to profile Silverlight applications. You should be able to use these tools to get started analyzing your application’s performance. Details regarding VS2010 profiling are available on the MSDN Blogs. Will Telerik create a MVVM framework similar (but better) than Prism and Silverlight FX? Telerik is not currently looking to build another MVVM framework. There are great options available for free today, such as Prism, SilverlightFX, and MVVM Light. We also offer tools like RadCommandManager to make it easier to work with MVVM-like concepts. I added a new model to OpenAccess and I see the article and video where you show me how to obtain data from database. How can I use the same model to update and insert data to database? Josh Holt will be posting an example shortly that shows insert/update/delete using OpenAccess in windows and web scenarios using the new context object. Follow his blog on the Telerik Blogs to learn more. When will OpenAccess support WCF RIA Services using POCO? OpenAccess ORM will offer support for WCF RIA Services in an upcoming release. As for POCO (Plain Old CLR Objects), we are evaluating the reasons why/when such support should be added. From our perspective developing Data Transporter Objects and Self-Tracking Entities will cover all the scenarios were POCOs would be used, with relatively small impact to performance, so you will see these first. If POCO support is important to your project, be sure to vote for the feature in PITS. Does the visual designer replace the wizard-based "reverse engineer" feature? The answer is yes, but it is a bit complicated at the moment. In Q1, we still don’t have a translation tool between the two formats (pre-Q1 OpenAccess and Q1 OpenAccess). Our advice is to use the new designer for new projects only until we provide support for upgrading complex projects based on previous versions of OpenAccess. In fact, by Q2, the designer will be a “roundtrip” editor (forward and reverse mapping), so you will have a way to alter the database as well. Can you add validation attributes? You will be able in the Q2 release. We are talking Data.Annotations attributes, of course. Are we basically throwing out the old way of OpenAccessing data? Do we still need to create scopes, and dispose of them...etc? The answer is a bit complex. We prefer to say that we are changing the designer experience and the API usage-pattern to better fit the .NET ORM world, where developers are familiar with tools like LinqToSQL and Entity Framework. The underlying OpenAccess “engine” remains the same and continues to provide the core support for features like data caching, object tracking, etc. Will there be a way to create a Domain Model from an existing OpenAccess project in the future? Definitely. We regard this as a “must” for the new OpenAccess designer, and we will be providing a tool to make this type of “migration” easy. So with the Data Context and with no scopes, are all transactions persisted instantly instead of batched till a commit? No you still must call context.SaveChanges() to persist changes to the database. The DataContext provides a more convenient way for working with the OpenAccess API, managing scopes for you internally. I saw you were able to get data from the database without using an ObjectScope. Is that replaced by the new Data Context? Yes, however, in the Q1 2010 release, only when doing reverse mapping. Forward mapping support for the new Data Context and designer will be added in an upcoming release. Will JustCode display the Fonts & Colors when printing? Currently, fonts and colors will not be printed. This is a limit of Visual Studio we are actively researching to work around. We will try to provide printing support for custom fonts and colors in an upcoming release. I just moved over from ReSharper. If I forget to include the using library statement or don’t know which library is needed for a type, will JustCode give me a hint to place the using statement in the class? Once you have typed the type name, put the cursor on the statement, hit Alt+Enter, and JustCode will present an option to add the missing reference. Review all JustCode keyboard shortcuts in the online docs. I noticed that there was only one Code Template in the JustCode menu for VB.Net. Is it possible to add more templates? Yes, it’s possible to create more templates, however VB templates cannot be context sensitive in the current version. We will continue to improve VB support for templates in an upcoming release. How do you configure JustCode Color Identifiers? VS -> Tools ->Options->Fonts and Colors. When JustCode is installed you will see entries in the list that start with “JustCode” for adjusting fonts and colors. Will there be a unit test runner built-in to JustCode? Yes! This is a feature we are working hard to provide in the Q2 2010 release. Let me take a quick break from the MIX action to deliver a post I tried to pull together before jumping on the plane to Vegas. Many of you joined us last week for the big Telerik Q1 2010 release and related Release Week Webinars. These daily webinars are your way to “jumpstart” your knowledge of “what’s new” in Q1 and our hope is that they make it easier for you to get started with the new bits. Enjoy the recordings and enjoy the Q1 release. More Q1 videos are hitting Telerik TV daily, so stay tuned for more helpful content. One day is in the history books here at MIX10, but Day Two is just about to get kicked-off with another keynote here in the Mandalay Bay Ballroom. I’m once again settled in to my seat (with more battery than yesterday) and I will be compiling your real-time “cliff notes” of the keynote news and announcements. It’s not live blogging- there’s a live stream feed that makes that pointless- but if you just want the highlights, this is your post. 9:05 AM: Dean Hachamovitch, head of Internet Explorer, taking stage as opening speaker. Today’s keynote is going to start by being a standards-based (HTML/Script/CSS) talk. HTML5 runs on GPU in IE9 (built on DirectX) – significantly more performant than FF/Chrome when handling complex visuals. Rendering engine built from the ground-up to run on graphics hardware. IE9 Platform Preview available today. Lightweight shell around IE9 engine (“Trident”) with demos. Platform Preview will be updated every 8 weeks. 9:35 AM: Microsoft’s keypharse for IE9: Same markup, Better performance. 9:36 AM: ScottGu taking stage to transition talk in to talking about server tools and platforms. Getting started by reviewing what’s coming in VS2010. Reviewing what’s new in ASP.NET 4, MVC, etc. Old news for most people, I think. 9:45 AM: We’re in the middle of some Hanselman demos, showing MVC 2, VS2010. Again, nothing new if you’ve been following along with MVC/VS2010 beta/RC. Most interesting part of this segment: new web-based tool, codenamed “Houston,” for developing/managing SQL Azure databases! 10:37 AM: My first instinct was right. The last 30 minutes have felt more like a developer breakout session than a keynote. Very data focused. Surprised this topic has received so much stage time at MIX. Almost think they ran-out of “keynote topics” and used this as filler. 10:42 AM: Bill Buxton taking stage to close out keynote. Refreshing return to keynote-style content and focus on design. Unfortunately, this part of the keynote is probably not going to be good for extracting “highlights.” Skip to this time in the on-demand recording of keynote for Bill’s content. “Project Gustav” is the painting program used at the opening of the keynote. Being built by Microsoft Research. Hardware is actually prototype hardware from Wacom- some mashup of multiple components that has high quality stylus and 10-point multi-touch. And things are wrapping-up now. Great opening and closing in today’s keynote. Middle…eh. Now on to another full day of sessions and Telerik booth/kiosk work. More updates as the week rolls on, both here on Telerik Watch and on Twitter. Welcome Telerik Watch readers to another LIVE update from a major Microsoft event! I’m settling in to my seat at the MIX10 opening-day keynote, where there are lots of exciting announcements expected. In the past, I’ve typed feverishly to bring you play-by-play updates from keynotes like this, but now that MIX is streaming the keynote live, that seems a bit redundant. So, instead, I’ll be “live blogging” the highlights. All the big news that’s worth remembering post-keynote. To get things started, this year’s keynote “warm-up act” is a 16-year old Seattle-native Yo-Yo Champion (Sterling Quinn). If you thought (like me) that being able to “walk the dog” with a Yo-Yo was skill, you don’t want to watch this kid. Scott is jumping right-in to content. Very different from last year’s long “abstract” design talk by Bill Buxton. Scott said he is going to focus on Silverlight today- on the RIA, media, and phone. 9:20 AM: ScottGu seems a bit off of his game. Lots of “uhs.” Almost as if he’s a little uncomfortable or unprepared. 9:35 AM: Scott came out and just shut-down the SL4 talk. Casually announced the SL4 news and pushed us in to the Windows Phone 7 part of the keynote. Audience picked-up. This is clearly what everyone is here to see. Demos now by Joe B. 10:00 AM: Joe is done with demos. Rest of keynote will be dedicated to talking about how you build apps for Windows Phone 7. ScottGu is back on. 10:10 AM: ScottGu built and deployed a simple Twitter app for WinPhone. Biggest applause of the day. Not “thunderous,” but definitely best of the day so far. Scott is back in his element. …And I’m back online with battery. Fortunately, there wasn’t much (any?) news after my battery death in the Day One keynote. Just a lot of demos showing apps running on WinPhone 7. Most important news in the keynote (highlighted in red above) came early. And sadly, no surprise dev unit Win7 phones for the MIX crowd…which I guess makes sense since the current unit has yet to pass through the FCC. I know this week has been a flood of Q1 2010 news and bits, but there is no rest for the crazy. Next week in Las Vegas, Telerik will be there in full force at Microsoft’s MIX10! MIX is Microsoft’s premier conference for web developers (and designers), and this year promises to be full of excitement. Everyone expects lots of news around Silverlight 4, Windows Phone 7 Series, Silverlight on Windows Phone, Internet Explorer 9, and surprises that will be icing on the cake. Telerik is a Silver Sponsor of MIX10 and we’ll be hanging-out in the new “Showcase” area in our Microsoft-supplied micro-booth. I’ll be there with a few people from the Telerik Silverlight product team, so if you have questions, want to see a demo, or just want to say hello, we’d love to meet you. Finally, if you want a shot at some “spot prizes,” make sure you bring and wear your cool Telerik t-shirts. I’ll be keeping my eyes open, and if I spot you in a Telerik .NET Ninja or Geekette or other equally awesome Telerik cotton, I may present you with a valuable prize. It’ll be the easiest way to win in Vegas! Oh! And, of course, I’ll do my best to “live-blog” from the MIX keynotes. It may be more of a “summary blog” now that MIX broadcasts everything to the web, but it’ll be your direct connection to all of the big news at MIX. See you in Vegas on Monday! About a month ago, we introduced a cool new support feature on Telerik.com called PITS: Public Information Tracking System. PITS is linked directly to the Telerik TFS data and it’s your window in to our planning and software construction process. If you’ve never explored PITS, read-up on it’s features and then try it out. It’s a very cool tool and a good showcase of “useful” Silverlight. If you have a Telerik.com account, you can login and vote for features and bug reports that are most important to you. Telerik uses this voting information to help us set the priority for what we’ll work on in the next release cycle. There is no easier way to impact the release process than voting in PITS. So, now that Q1 2010 is out the door, you can visit PITS and start voting for what you want to see in Q2! When in PITS, you can “Show Issues For” specific products, and you can also filter issues “scheduled for” a specific release. To vote for future issues, change the scheduled filter to show “Not Scheduled” issues. You can then click on issues, give them your vote, and even leave a comment for extra feedback. Don’t see a feature you want listed? You can also quickly submit new feature requests via PITS. So far, the Extensions for MVC is the only product with a lot of Q2 ideas in PITS, but other products will be exposing more ideas soon. And if you’re an MVC fan, the top voted feature right now for Q2 is Grid column resizing. Not what you want? Vote now! One of the main "challenges" in making a switch from ASP.NET WebForms to ASP.NET MVC is- or rather has been- the lack of a functional data grid. There are many examples showing you how to use a different views for reading and editing data in MVC, but few that show the true "grid experience," where data review and editing can occur in a single view. Enter the Grid for MVC in the Telerik Extensions for ASP.NET MVC, and specifically the new data editing features in the Q1 2010 release. These videos will guide you to a complete understanding of MVC Grid data binding and data editing, both "server-side" (in other words, using HTTP GETs) and using AJAX (or, binding to JsonResults). Enjoy! Phew! That’s a lot of updates. And that’s not everything we’ve been working on over the last few months (believe it or not). You may have noticed that there is no mention of WebUI Test Studio, Sitefinity, or our TFS tools here. Make sure you’re following us on Twitter to get updates about those products in about 5 weeks. There will even be a few surprises! In the mean time, download and enjoy Q1 2010! Lot’s more on the new stuff this week on Telerik TV and the Telerik Blogs. Now that the entire world is on Twitter, it’s more important than ever to let them know about Telerik’s new Q1 2010 release. As you know by now, this week is the Q1 2010 Release Week, and no, the new bits aren’t available just yet. The bits will start to be available no later than Wednesday, but the Q1 2010 release fun starts tomorrow! The Q1 2010 Release Overview and What’s New in ASP.NET AJAX and the Telerik Extensions for ASP.NET MVC webcast happens tomorrow, Tuesday, at 11:AM EST. If you attend live, you have two chances at winning a Telerik Premium Collection. Register now! Telerik Q1 2010 is awesome! I love everything, even the packaging!! You get the idea. One entry will be counted per Twitter account, but you’re free to tweet as much as you want about the release. The counting starts in about 7 hours! It's hard to believe, but the Q1 2010 release is just a few days away! Next week, Telerik will ship updates for all 8 Telerik developer products- RadControls for ASP.NET AJAX, WinForms, Silverlight, WPF, Telerik Extensions for ASP.NET MVC, Telerik Reporting, OpenAccess ORM, and JustCode. It's a big release (as all releases are at Telerik these days) and there are a lot of new and improved features to take-in. How do you know where to start? The release Webinar Week. We'll be giving away Telerik Premium Collections at all of the live webinar events (two for the kick-off event on Tuesday). You must attend live to win, so if you can make the live events, join us for extra chances at winning prizes. We'll see you at 11:00 AM (EST) on Tuesday! As you know from my last minute post on Friday, I spent a part of this past weekend in southern Florida for the South Florida .NET Code Camp 2010. As usual, it was a great time, with lots of eager .NET learners and interesting content. And while it looked like some of the speakers might not make it due to the storms in the North East, I think almost everyone made it to the event. A big thanks to everyone that came to the Code Camp, especially all of you that packed my two sessions! Meanwhile, I learned, or rather re-enforced, another little tidbit on this trip: Nobody in South Florida uses Twitter. How many of you “use” Twitter? That is, do you tweet? How many of you “lurk” on Twitter (you read, but don’t tweet)? Those that don’t respond to either question are either A) already sleeping, or B) presumed to not use Twitter at all (read or write). Traditionally, I’ve found that in a “normal” developer audience, no matter where in the world I’ve done this poll, only 10% (or so) of the audience does anything with Twitter. In other words, In a room of 50 people, 5 people (on a good day) use Twitter. Florida was different. In two rooms of 50+ people, only 1 person admitted to using Twitter. More reinforcement of the idea that Twitter is a much smaller active community than the numbers suggest. Congrats to both! You each get a Telerik Premium Collection. And you may now resume not using Twitter. Thanks again for attending my sessions and feel free to grab the session resources below. See you next year!